Mark Zuckerberg in early April held a ﬂashy press conference to launch Facebook Home, a new app for Android that turns a phone into an always-Facebook device. Its Cover Feed takes over the phone’s home screen with wall updates. Its Chat Heads messaging system has photos of your friends in cute circular icons that can be accessed from other apps. Facebook Home was drubbed immediately by reviewers, earning 2.3 out of 5 stars in 17,000 ratings on the Google Play store. Zuckerberg has a problem on his hands if the initial Home ﬂop signals a struggle ahead at amassing more mobile real estate and users’ attention spans. Facebook got 30 percent of its $1.25 billion in ad revenue in the ﬁrst quarter of 2013 from mobile, up from 23 percent in the prior quarter, but its arsenal is pretty much just its original app; a Messenger app and Poke (which don’t have ads); its mobile site; and Instagram (which also has no ads). It needs more tendrils into smartphones to reach younger users who are increasingly opting to hang out on newer social apps like Snapchat, Whatsapp and Path. On mobile, Facebook’s ability to wring ad revenue from users is hemmed in by Apple, which doesn’t allow Facebook or anyone else to conduct digital transactions outside the App Store, and by Google’s widening footprint of apps such as Maps, Hangouts, YouTube, Google+ and mobile search. The law of large numbers is catching up, too. Now at more than a billion users, Facebook grew 23 percent in monthly active users in the ﬁrst quarter, down from 32 percent growth a year ago and 53 percent in June 2011. Most of its growth is coming from Asia and other developing markets, where monetisation is much lower. That’s why the news of Facebook’s potential acquisition [which didn’t happen] of social navigation startup Waze made complete sense. 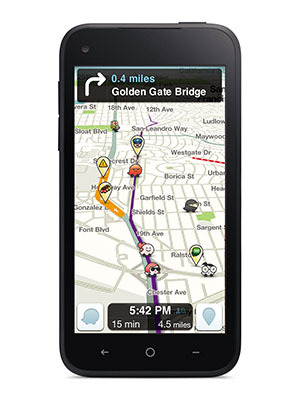 Waze is a free, ad-supported social network with more than 40 million highly engaged drivers who switch on the app for GPS turn-by-turn navigation. The service ingests streams of road condition data and spits out real-time traffic and road alerts. Facebook and Waze were meeting almost daily to discuss a deal that was valued at up to $1 billion, according to sources close to the companies. Neither Facebook nor Waze, based in Israel, commented. Drivers who join Waze have proﬁles and can message each other, but they’re also tracked and can be fed targeted ads for nearby destinations, helping Facebook in its thus-far unsuccessful game of catch-up with Google in the local ad market. Waze is the kind of must-have service that Facebook needed if it was going to extend deeper into users’ lives. A commuter in downtown Los Angeles is going to be more worried about how long it will take to get home on the freeway than about his high school friend’s ﬁshing trip photos. If Facebook had ended up buying Waze, it would have likely treated it in a hands-off manner, just as it has done with last year’s $740 million acquisition of photo-sharing service Instagram. That deal was also motivated by Facebook’s appetite for a huge base of users it didn’t own. Waze could have just been another way of buying friends.